Batman and Robin each order a pizza. The circumference of Batman's pizza is 20 percent greater than the circumference of Robin's pizza.The area of Batman's pizza is what percentage greater than the area of Robin's pizza? 1. Decided that the best question was: Which pizza is a better deal? 3. Realized that area is the way we measure which one gives us the most pizza. 4. 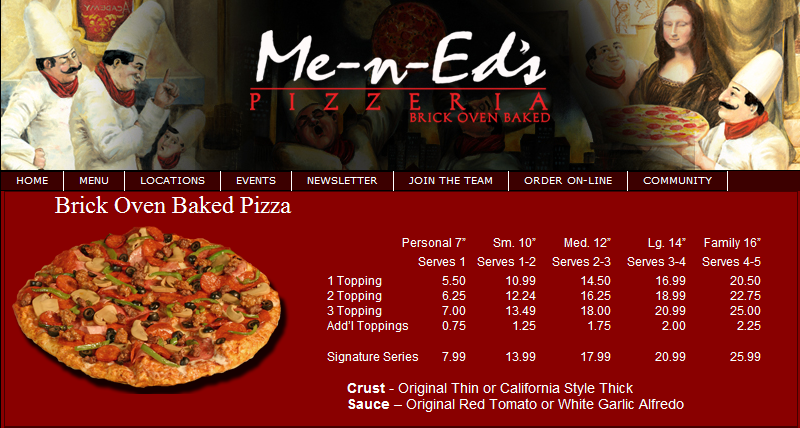 Determine area of each pizza and calculate $/sq". 5. Sidebar: Is $/sq" or sq"/$ a better rate to use? Let them decide, but make them justify. 6. Extension: What are we really paying for? Not the crust. Assuming that the average pizza contains about 1" of crust on the circumference, removing it takes the personal pizza from $.14/sq." to $.28/sq". 7. Synthesis: We brought out the laptops and put our data into Excel. I allowed them to enter the diameter and cost for each pizza then showed them how to use the function and fill features to have the program do the number crunching for them. I'm actually disappointed with myself for not doing this earlier in the year. 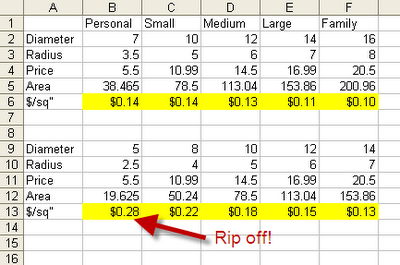 I often forget how powerful Excel is for teaching math. 8. Conclusion: If you order a personal pizza, eat your crust! 9. Reflection I wasn't prepared to handle the question on rates. I think in terms of $/sq" and assumed that my students would too. I also took an opportunity for student ownership away by drawing the two 7" pizzas inside of the 14" instead of allowing the student who came up with the idea a chance to shine. I'm taking this one on the road and will swap classes with other teachers in my department to see how their kids handle it. 10. What else would you have done with this lesson? I feel like this quite often. And I received a tweet from @mrhodotnet with this TED talk by Barry Schwartz on the Paradox of Choice. There are a couple of references in this talk that will keep me from showing it in its entirety to my classes, but there was one story that really struck me. One that I had to share with my classes. Schwartz talks about a time when he has to buy a pair of jeans. The last time he had done this was when there was one type of jeans that fit horribly until they had been washed a few dozen times (anyone remember Levi's 501's?). When asked what kind of jeans he wanted this time, he replies, "I want the kind that used to be the only kind." The clerk being clueless as to what this meant proceeds to show him his options. After about an hour of trying things on, Schwartz settles on the most comfortable pair of jeans he had ever worn. But here's the kicker--he says he did better but felt worse. He had purchased the most comfortable pair of jeans he has ever owned yet felt worse about the experience. Why? Because maybe he left the best jeans in the store. I think our students experience daily. What is the rate of change in this equation? 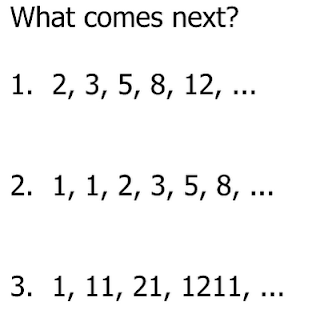 I'm convinced that these I dunno's are a result of our student being afraid of leaving the best answer unspoken and find it safer to stay neutral. Quit standing there in you underwear and put some pants on. Don't worry about finding the best pair. Pick one. Don't worry, they'll break in. I think I'll get a little mileage out of this metaphor. They come in 10 sizes: 36, 40, 48, 56, 72, 88, 113, 138, 163 and 180 which is based on the number of pieces of fruit that can be packed in the box. I wonder what would happen if we showed the same respect for instructional time. For those of you who have been reading a while, you know that I'm not the best lesson planner in the world. My SmartBoard slides aren't always the best designed, although that's something I'd like to improve upon. And I'm not that creative with activities. But today, I realized that I'm pretty good at getting out of the way when some real inquiry shows up. My 7th graders just finished state testing yesterday and I wanted to help set the stage for what I'm going to expect from them next year as 8th graders. The 7th grade curriculum is not much different than grades 2-6; it's very skill based. My kids are very good duplicators, but I want them to become good applicators and eventually creators. I explicitly said that to them today. I want them to focus on representing their ideas as many ways as they can. Anyway, the theory goes that you don’t understand a mathematical concept until you understand it in TWO modalities. I do very well with visual knowledge, so my notes of understanding are full of color and pictures and mindmaps and arrows linking concepts, and I highlight the holy hell out of math books. However, I don’t believe I KNOW a concept until I can explain it verbally, because I can barely understand anything if someone just talks it at me. First swipe is through my best modality, second swipe is through my worst modality. The whole “learning style” thing may be overstated, but it remains true that getting students to understand things in a variety of modalities seems like the way to go. 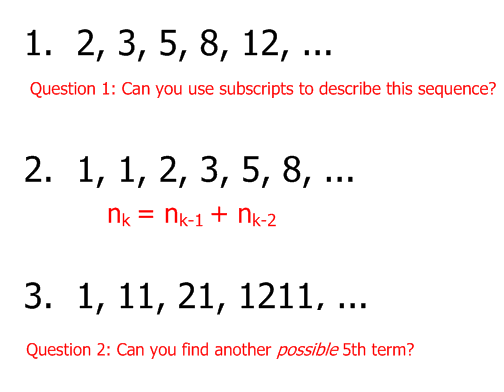 Note: I'm pretty sure you get sequences 1 and 2, but just in case, sequence 3 has to do with words. The first term has one one (11), the second term as two ones (21) and so on. So n5 = 111221. Kids are really good at finding the next numbers but pretty lazy about writing a good description of the rule. The had to add, "for example" to many of their written rules. The challenge was to have them write a rule that was short but stood alone. The got it. Challenge: Can we write a rule in Mathanese? "So, if n5 = n4 + n3, what does nk equal?" "nk = nj + ni." This led to a great discussion on how the alphabet doesn't nec-ess-a-ri-ly have one to one correspondence with the whole numbers. Good talk nonetheless. We ultimately settle on nk = nk-1 + nk-2 and for the most part the class was good with that. "Each of the previous terms are describing what comes before it, but does it have to be as you read it left to right? Could it just be describing the amount of times the digit shows up in the term." "So if I would have given you the fifth term, would your rule work?" Then Joe comes out of nowhere. "Are there more possible right answers?" I let them choose which question interested them the most and split the class into two groups to investigate. Group one came awful close to saying that nk = nk-1 + k - 1. They're not quite there so I'll let that one marinate for the night. Group two came to the conclusion that there were no other possible 5th terms. They were a bit disappointed because they thought that they got the wrong answer. "No, no, no. You had a question. You investigated it. And you decided that the answer was no. Can you explain why the answer is no?" "Then that's a good day's work." Gonna have to finish the algebra tiles tomorrow. Do you grade formative assessments or not? Is it inquiry or an investigation? Why does it have to be either/or? I don't care. Just bag my groceries so I can go to my car. And hurry up before that guy with the clipboard and stopwatch comes and starts asking questions. In the age of accountability, we have become increasingly skill based. That's not necessarily a bad thing. But I've noticed that with each benchmark, common formative assessment or state test we give, teachers have the tendency to focus on the product and not on the process (ie. let's give them the skills and pass 'em down the hall). I encourage inquiry with my students. I allow them to fall down the rabbit holes we encounter. In fact, I've been known to scrap the lesson for the benefit of a good question a student has asked. Most of us do. But the one thing that I've noticed as well is that even my grades have become increasingly skill based. I've been wondering how to assess the problem solving stuff. A colleague clarified some of this for me the other day at lunch. We were discussing the idea that once a student has been shown how to work a problem, it then becomes an exercise and no longer carries with it the attributes that allow a student to be a problem solver. He shared with me that he noticed how his students would ask for an example every time he tried to get them to do some problem solving and how that just didn't sit right with him. It doesn't sit right because the student is trying to take a problem and apply the teacher's algorithm to it. If the example is close enough, he can plug and chug, get an answer and we'll be none the wiser. If we can get our kids to be proficient with the skills, show the ability to put them together in a problem solving situation and occasionally surprise the pants off of us with one of those "wow-look-what-you-did" moments, I'd say we'd call it a good year. This continuum can be tricky, though. The more time a student spends wrestling with the skills, the more time we need to be there for support. As a student becomes proficient with the skills, we can let go a little more and become a facilitator. I think that many teachers get frustrated because they hear of these great things that are going on in the classrooms of others and wonder why it won't work in their room. Well, maybe it will. But maybe it's because we've put the kid on a mountain bike before he can ride the tricycle. Can't expect a kid who is buried in skill acquisition to blow the doors off you with his inquiry methods--which isn't to say that the student doesn't have the ability to inquire, it may just need some dusting off. At the end of the year, I'd like my students to be able to duplicate skills, apply skills and create something using the skills. Description: Here's the tool. Here's how you use the tool. Show me you know how to use the tool. Do it again, I don't believe you. One more time, just to be sure. 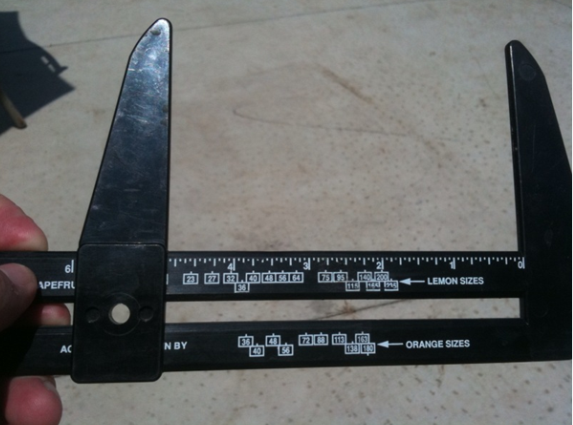 Alright, you are now allowed to use this tool whenever you see fit. Essential question: Can you use the tool? How: How these skills are taught may vary. Direct instruction, investigations, Socratic method...I don't care. At the end of the day, the student is acquiring a skill. The more of the lifting they can do themselves while acquiring these skills the better because they are preparing themselves for the next steps of application and creation. Asking questions is going to be the teacher's best friend. 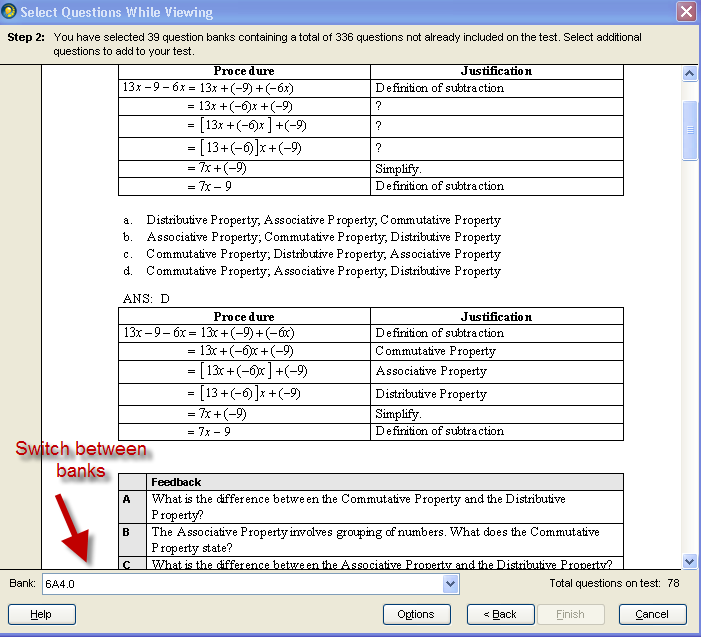 Assessment: Skills tests in the form of multiple choice or free response. Students are free to reassess at any time during the year as their understanding of the skill changes. This is why I don't have a problem with posting study guides and online examples. There are no surprises on my skills tests. Each different skill corresponds to a different assignment in the gradebook. I'm not really too concerned with how they arrive at the answer as the focus is on the product. We don't give finals in our middle school, but next year I am going to give a summative test every 6 weeks or so that cover all skills to date. For example, the first assessment will cover skills 1-8, the next will cover skills 1-19, and we will end with a cumulative skills test covering skills 1-39. Description: I want you now to build something. Choose which tools you will use. Make sure your final product looks like *this*. Essential question: Can you put more than one tool together to do something you haven't done before? How: Give students a problem that uses skills they already have and walk away--sometimes literally. In this process, I think the students should generate more of the questions--although prodding them along with a question now and then isn't a bad thing. Be careful though, I have found that sometimes I have to take a physical posture of audience member by actually sitting down and looking at the floor in order to cease being the primary resource. Assessment: This can be in the form of a teacher created project, short assessments requiring students to demonstrate their thinking or even an observation during class. I've thought about including higher level problems in my skills tests and students who successfully solve the problems earn a 5, but then I run into the problem of reassessment and context. The skills test will often give a context to the problem that we may not want the student to have. Reassessment on this will be different because it isn't about the particular problem, but the process by which the student attacks the problem. I'd argue that the skills necessary are irrelevant as long as the students being assessed possess the skills necessary to solve the problem. 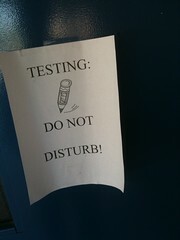 If this is a written test, it should contain problems the students have never seen before. So I'm thinking about a "Problem solving" weighted category or maybe a weighted standard that is dynamic the same way the other standards are. Description: Now, what would you like to build? Design it. Plan it. Build it. Reflect on what you built. Did you choose the right tools? What would you do differently next time? Essential question: Do you understand your set of tools well enough to recognize what types of things you can and can't do? How: Student generated projects. My 7th graders are working on a relations project where they choose two variables to compare, gather data and investigate the relationship. Final product will include multiple representations of their data and a presentation using the medium of their choice. (I'll blog about it after we finish state testing.) I really like what Shawn Cornally is doing with his physics kids. If anyone can help me figure out how to do this with some precocious middle school math students, write a book and I'll buy it. Assessment: The project is the assessment. Success in any of the higher levels validates the lower levels. For example: If a student can demonstrate problem solving ability by writing an equation and solving it, then not only does this affect the problem solving score, but it validates the equation solving skill. If a student can create her own project, then I'd say problem solving looks pretty strong as do any skills that were present in the project. The worst part of all this is that we gotta give it a grade. How do we arrive at a final mark? This year, I left my grades uncalculated until the marking period opened and once grades were submitted, they went back to being uncalculated. I wanted parents and students to focus on the score for each skill and not the "averages." To arrive at a final mark for the students, we look at our rubric the same way one would view a grade point average. This was simple because there were no weighted categories. But now with the fact I want to focus on problem solving, projects and include summative tests, I need to figure out how this should look in the grade book. Where does problem solving show up in your gradebook? Should the scores on the summative tests have their own category in the gradebook or should each skill be treated like it's own reassessment? Today, I threw this problem up in front of my 8th graders and they looked like they'd seen a ghost. I like this problem because today it was an opportunity for them to show their problem solving skills. They have all the tools they need to solve this problem, but they need to figure out which tool to use and when. Tomorrow it won't be a problem solving opportunity. Tomorrow it becomes an exercise. It may be a complex exercise, but it's an exercise nonetheless. Now that they've seen this problem and know how to work it, I have to view it differently. It has to carry less weight if it finds its way on an assessment because now the problem provides its own context for them. I think that in order for a student to be considered an expert, she needs to demonstrate the ability to do something with the tools beyond what she's been shown. When students encounter a problem on a test that makes them say, "but he didn't show us how to do that in class," that's a good thing. It's true that standards based grading in math can be more than just reporting specific snippets of content knowledge. (there ya go Matt) It has to be more than just skills because I don't have a problem posting my skills online with examples of how to perform the skill. I don't mind showing them what they need to know and them assessing them on that content. I do mind stopping there. The skills are the floor, not the ceiling. How we best help students realize they need these skills is a great conversation that I'm looking forward to seeing fleshed out. But I think that there is also a need to discuss not only what exactly we need to assess but how. I'm not of the opinion that we should assess behaviors like organization, responsibility, etc. I do think that we should assess skills that may be consistent throughout our content area but not limited to our specific course. This leads me back to the assessment question I asked in my previous post. How do I assess this ability to know when and how to put the tools together? Do I treat it as a skill/standard and allow the score to change as students demonstrate their ability throughout the year? Is it enough to involve my students in activities that promote problem solving and simply grade them on what I observe in class? Does it show up in a summative assessment testing multiple skills? If so, do the other "skills" that are on the test tip the student off as to the context of the problem at hand? Do we use projects for students to demonstrate the ability to put a string of skills together in order to create their own meaning? Alright, brain's empty. Time to go home. I've had a few interesting conversations regarding skills students need in order to be successful but don't actually make it into the gradebook. You know, the homework-organization-studyhabits-notetaking type skills also known as "soft skills." I noticed that Shawn Cornally has "Investigation Standards" he uses in his class which makes me question the existence of a third set of skills that aren't necessarily content driven nor are they "soft." I suppose one could argue that investigation standards are appropriate to a science class as they are often times embedded into the content skills. But are there skills that are embedded into a math classroom that may or may not actually be figured into the grade of a student who has a teacher using SBG? 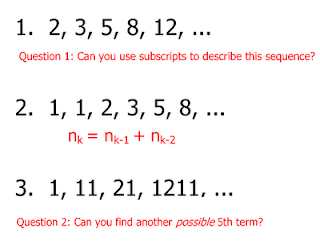 Where do things like: applying problem strategies, using multiple representations (Rule of 4) or showing multiple ways to work a problem fit into the grade book? These are the golden threads that run through all of our math courses so why wouldn't we measure them? Do they deserve their own place in the gradebook? 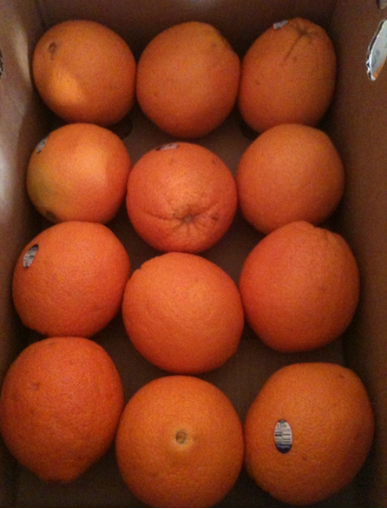 If so, how many of them are there and what are they? I get my students as 7th graders and keep them until they finish 8th grade. It's actually a pretty sweet deal. They come to me precocious little farts children and leave precocious big farts teenagers who can question things a bit better. My biggest fight(s) comes when I ask them to show their "soft skills" (read: take notes, show work, etc). I'm pretty sure you have the same problem. I'm starting to wonder if the fight is worth it. Will they pick up these "soft skills" as they need them, or do we have to teach them to do these things? I say, "Show your work." They say, "Then challenge me." I say, "Don't forget to take notes." They say, "Why? I'm not going to look at them again. I don't need to." They say, "Then quit talking so much." I don't know. Maybe I've had it wrong. Students have been working on the Farming Project for a while now. I've not assigned a "due date" because students are working at different pace due to their progress towards skills proficiency. I'm not too worried about copying since everyone has a different sized plot of land. The inequalities will be similar but they have to explain the process to me before I'll sign off on the skill anyway. So they have to convince me they "get it." Most of my more advanced students have worked their way through most of the first five tasks. I've had some interesting conversations with students-especially the more advanced ones. One of the restrictions in the project is that cotton can take up no more than 80% of their land. "So why is that your inequality?" "Because I can't have more than 80% cotton, I need to multiply by .2"
"Because it has to be less than 80%." "Alright. What's the maximum number of acres you can use for cotton?" "700 times .8 which is 560. Oh, so I need to multiply by .8 and not .2." "So what is that going to look like on your graph?" "I go to 560 on the x axis and shade to the left." "Are you using a number line or the coordinate plane?" 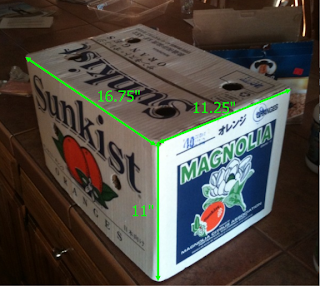 "Coordinate plane. I need to find a polygon to shade for all of my restrictions." "If 560 is your maximum, what is the minimum?" "Because if 80% is my maximum, 20% is my minimum." "Step away from the math for a minute and tell me what is the minimum number of acres you can farm." "So you're telling me that if you are a farmer, you can be required to farm a certain number of acres of a particular crop?" "No, but if I am trying to maximize my profit, I wouldn't farm zero acres." "Ah, but what was my question?" I find this type of exchange to be pretty common with my students. It's almost as if they are trying to live up to some sort of image of what a good math student looks like and often they check the common sense at the door. Kind of like the opposite of what Jason describes here. So why do districts have a staff full of IT people who are great at networking, troubleshooting hardware/software problems, etc. but don't have a single person to help teachers implement the technology in their classrooms? Why are there SmartBoards all over the place and many of them are used as the screen for the overhead projector? Or maybe, just maybe they are being used as a glorified white boards whose markers don't run out of ink. Where is the person who can show a teacher how to use a SmartBoard in their specific content area? Where is the person who says, "what types of things would you like to do in your classroom and how can I help you find ways of doing that?" Where is the person who can actually take the time to research different tools and help teachers use them to take their current lessons to a different level? Where is the person who has an understanding of the curriculum and can help teachers develop lessons that they never thought were possible? I'm not upset or anything. Just askin'. let 'em "play with math"
But I've yet to see a concrete example of what it all looks like. Are these just the phrases we should use to demonstrate we're in the club like some sort of secret handshake? Or was I absent that day it was all discussed? If so, can I borrow your notes? This probably isn't the most pedagogically sound thing I do, but it works. We usually carve out a couple of weeks for test prep and I have a bunch of practice problems for my kids to do. At this point, I usually go from teacher to coach. By that I mean, we are simply trying to prepare these kids for what they are mentally going to have to deal with when they have that test in front of them. I put a clock on them to add a little extra pressure because they tend to stress themselves out anyway. I guess I figure they either need to learn to take the stress out of their tasks or they need to learn to work through it. I don't spend much time talking about the importance (or lack thereof) of "The Test" during the first semester, but whether we like it or not, these kids are going to have to deal with tests in some way-shape-or-form for quite some time. I can downplay its importance all I want, but my kids (and their parents) have bought into THE STATE TEST. Every one of us has a breaking point. We all have a part of us that eventually says, "I don't give a crap how the rest of this goes, I just wanna be done." And I spend some time talking to my students about this. On a long test--whether it's the SAT/ACT/GRE/MSAT/LMNOP or just a semester final, a student reaches a saturation point. For some it is at about the 50th question or so; for others, it's right after the test starts. I figure my job is to help them take those thoughts captive, recognize where their threshold lies and encourage them to push through it. We just finished today. I can see it in their eyes. It's that I-really-get-this-stuff-now-but-I'm-ready-to-do-just-about-anything-but-this look. And I'm kinda ready to do something else with them too. I use the phrase summative assessment very loosely because as long as my class and I have some time together, they can continue to improve upon weaknesses. But with most of my assessments covering one skill at a time, there may be a need for assessments that check for retainment of concepts (ie. benchmarks, finals, etc.) Now that I have created assessments for each skill, I want a way to create assessments that combine multiple skills and, ultimately, culminate into and end-of-course-test. Fortunately, I don't have to re-create the wheel. 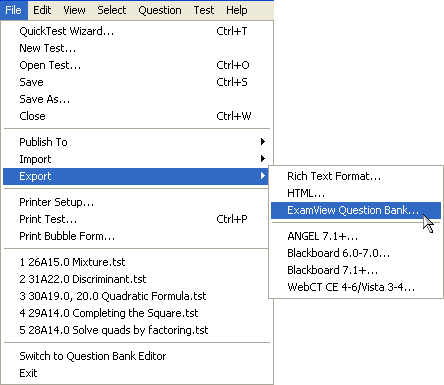 Simply take an existing test and export as a question bank. 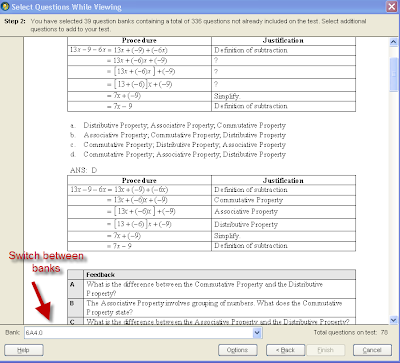 This will allow you to use these questions in the creation of future tests. For this test, I chose to select questions while viewing. I have a good idea of which skills/standards I want on the test, so I want to be able to look at the question before selecting it. 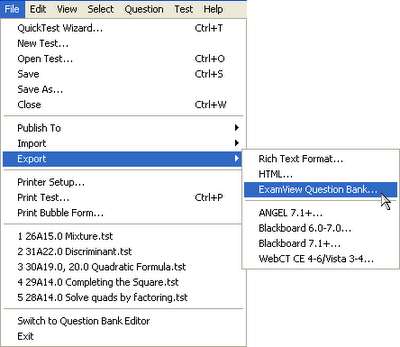 Now that I can view the questions, I just need to be able to switch from one question bank to another. Did I mention, that I'm kind of a fan of this thing? 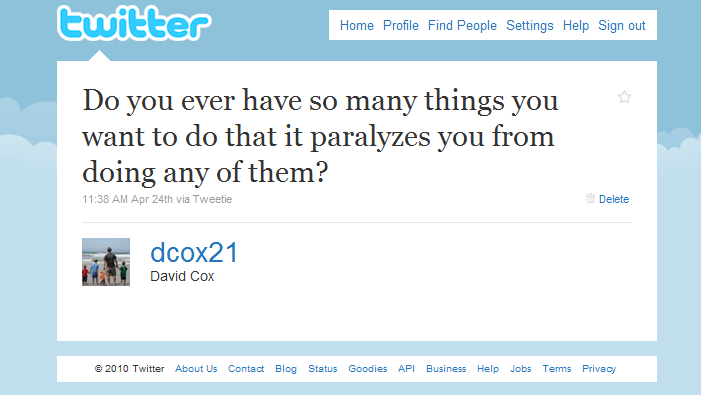 "Mr. Cox, I don't know how to do this." "What's it asking you for?" "I am supposed to find the x-intercept." "2x + 3y = 6." "So what do you know about all x intercepts?" "Alright, then give me an example of an x-intercept." "That's a number, give me an x-intercept." "Ok, now what can you tell me about all of those x-intercepts? What do they have in common?" "Oh, that's right, I let y = 0 and solve for x." It's funny how the default is always "I don't get it." Don't let 'em fool ya. They know more than they let on. I'm all for a challenge, but this one is tough. I have a student who completely freezes when called upon in class. I mean, I've had kids who get really shy and give the shoulder shrug in hopes that I forget I asked them a question. I've dealt with kids who try to lay low in hopes that if they aren't looking at me, then I'm not looking at them. But never, in my 15 years in the classroom have I had a kid who actually leaves the classroom when spoken to. And believe me when I say that I've emptied my bag-o-tricks on this one. That is until the other day I made myself invisible too. Students were doing some review work and I went and sat next to this student who was burying himself in his work-almost to the point that he was under his paper. He was low; so I got lower. He is quiet; so I got quieter. "Why don't you answer me when I ask you questions?" "Have kids made fun of you before?" "Has anyone made fun of you in my class?" "Do you know what I'd do if they made fun of you in here?" "Ok, so I won't beat 'em up, but I will NEVER allow a student to make fun of you, ok?" "So let's set a goal. Before the end of the year, I want to be able to ask you a question from across the room and you answer it, alright?" And off I went. I had sat next to him before and spoken quietly, but I had always been louder and more conspicuous than he was willing to be. Yesterday, he used his vocal chords. A few days ago I had a great conversation with a couple of other math teachers while doing bus duty. One of the teachers is in his third year and he was describing what reminded me of the scene from Summer School where the students take turns humming just to piss off the teacher-really giving him a rough time. Some teachers offer advice like, "make sure you bring the hammer every day" or some other respect-my-authority-if-I-say-jump-you-ask-how-high type of classroom management philosophy. I remember being 23 and teaching younger brothers and sisters of kids I went to school with and how fine that line is between being relevant and trying to buddy up with students. As a result, I think I tried to impose authority unnecessarily and it didn't take too long to figure out that it doesn't work. After a few minutes I asked, "did you get in much trouble when you were younger." I figured the problem is that he doesn't have a mischievous bone in his body and he has no way of getting into the heads of his students. He doesn't understand the thinking of a kid who doesn't automatically respect all the adults he encounters because he wasn't one of them. What advice do you give a young teacher when his students are going out of their way to give a hard time?